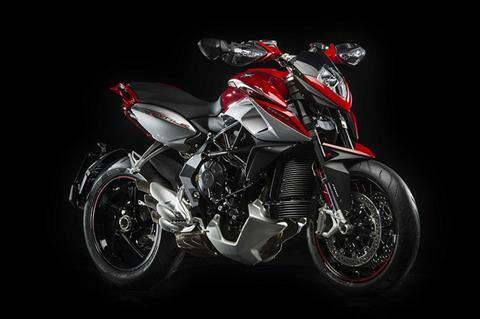 The Rivale 800 redefines the concept of two-wheel exclusivity: the exclusivity of unmatched design, engine technology and electronics that, together, make this motorcycle the real-deal thrill machine. The revolutionary in-line 3-cylinder Rivale engine is the bike’s beating heart that, together with ergonomics specifically developed for comfort and full control under all riding conditions, make it an outstandingly versatile roadster. ENGINE: Outstanding performance and efficiency have made this in-line 3-cylinder engine, designed and manufactured entirely by MV Agusta, a true classic. 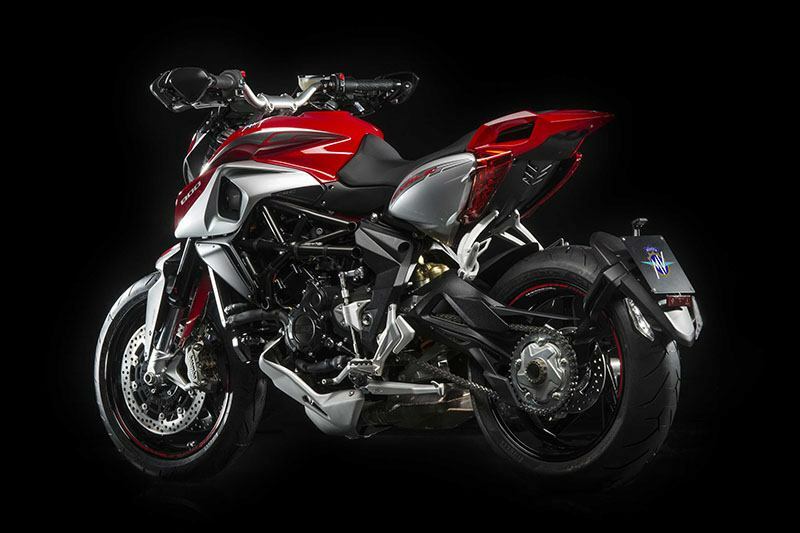 Of course, the market does offer other three-cylinder engines, but none of them feature the extraordinary compactness of the MV power unit, achieved via the adroit application of uncompromising technical solutions. For example, the engine block is of the closed-deck shell-cast type with integral bore liners. 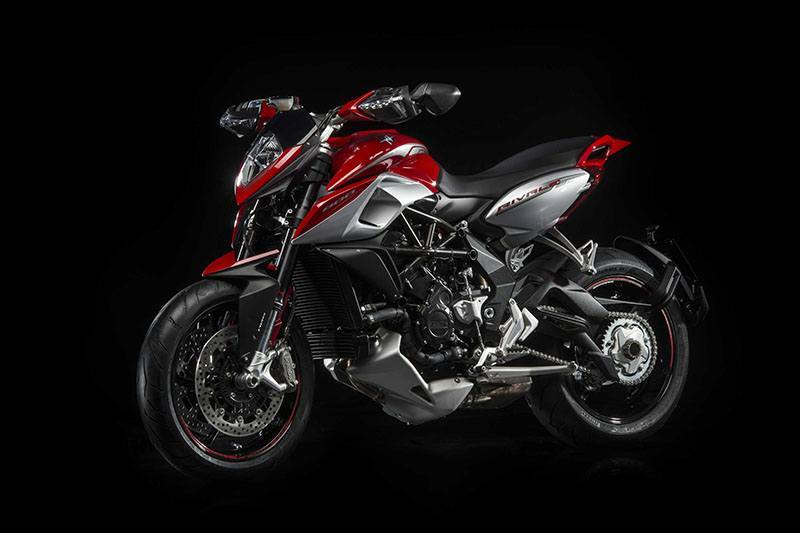 Liquid coolant and lubrication circuits are incorporated inside the engine, as are the relative pumps, significantly reducing size and sculpting that high-class style quintessential to every MV Agusta. Other key indicators of technological excellence are engine weight (only 52 kg) and the counter-rotating crankshaft; the latter, a racing solution used extensively in MotoGP and now available on a production series MV Agusta for the very first time, reduces inertia during changes in direction and makes the most of the bike’s intrinsically excellent handling. The timing system consists of a double overhead camshaft with four valves per cylinder; both intake and exhaust have been designed specifically for the Rivale to match its distinctive power delivery specifications. A removable six-speed gearbox provides further demonstration of the engineering excellence on this model, as does the EAS (Electronically Assisted Shift), an ‘electronic gearbox’ that cuts the time taken to change gear. 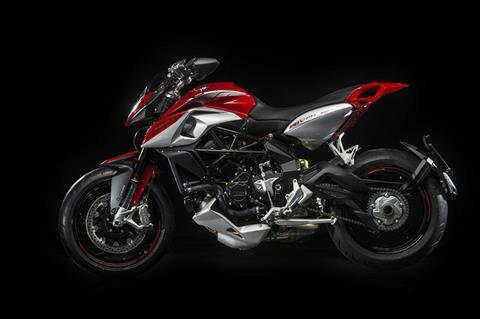 The bike also features a multi-disc oil-bath clutch and effortless clutch lever operation. 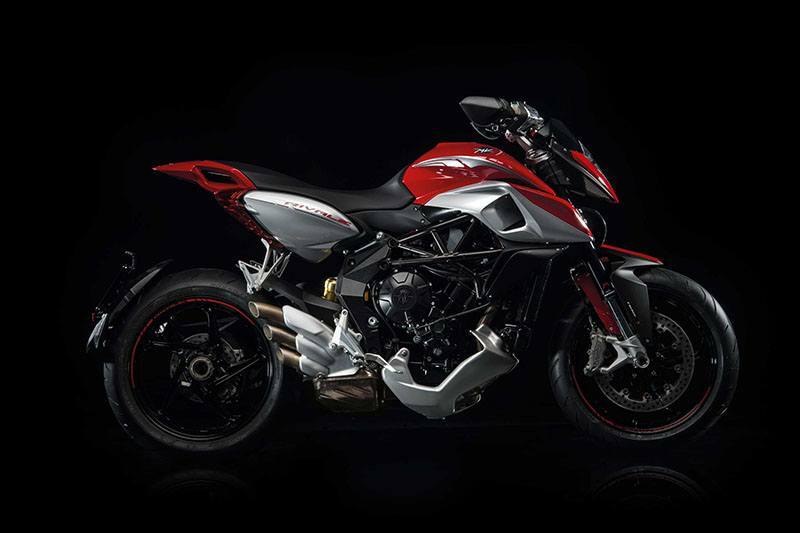 Power and torque have been tailor-made to get the very best from the Rivale's chassis set-up, creating a bike that is, quite simply, an adrenaline-fuelled joy. 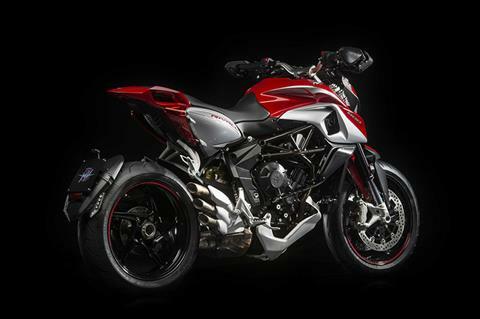 The exceptional versatility of the in-line 3-cylinder engine – able to produce 148 bhp on the supersports MV Agusta F3 800 - ensures exhilarating yet fluid power delivery: with 125 bhp at 12,000 rpm and a maximum torque of 84 Nm at 8,600 rpm, the Rivale ensures amazing performance throughout the rev range and lightning-fast Full Ride By Wire throttle response. ELECTRONICS: The MVICS (Motor & Vehicle Integrated Control System) platform is a milestone in the development of the MV Agusta 3-cylinder project. Its integrated control logic ensures the system synchronizes all the electronic control parameters of the motorcycle simply yet effectively, enhancing performance and optimizing thermodynamic efficiency under all riding conditions. The Full Ride By Wire throttle and comprehensive control panel constitute the rider-MVICS interface, while handlebar controls let the rider set numerous customization and safety parameters at the flick of a switch. Customization and safety, in fact, are what the MVICS platform is all about. 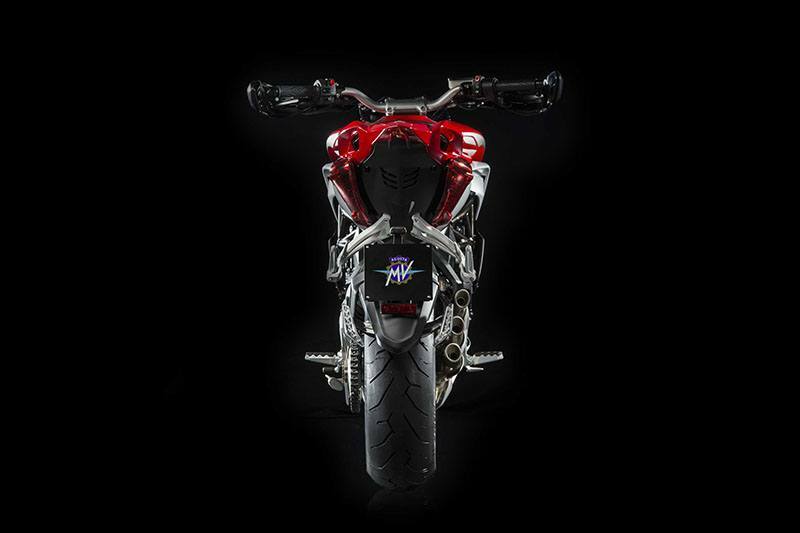 With this innovative system riders can choose from four different engine maps: the first three (sports, normal road usage, wet road conditions) are factory-set, while the fourth lets riders customize individual settings and so attain performance that matches personal preferences and riding conditions to perfection. The far-reaching MVICS customization capabilities cover engine response, rev limiter, engine torque response, throttle and engine brake sensitivity, not to mention the 8 levels of traction control, devised to make sure the power is put down on the asphalt perfectly, even where road conditions are critical. The all-new dashboard has been specially designed for the Rivale: entirely digital, its large easy-to-read display indicates, first and foremost, current speed and rpm. While this highly versatile instrument panel lets riders choose which info they want on display, the selected engine map and currently engaged gear are always clearly visible, as is the traction control setting and coolant temperature. Cutting-edge display technology ensures all the info remains perfectly readable under all lighting conditions. Handlebar controls have been designed to maximize rationality and ergonomics: every single button and switch is comfortably within reach and the meticulously shaped brake/clutch levers allow for adjustment of the handlebar gap. Lightweight and robust, the foot controls are made of aluminum alloy and have been designed specifically for the Rivale. Foot pegs feature a rubber lining to reduce vibration yet still ensure a sure grip with motorcycle boots or even casual footwear. The gear shift lever is protected by an elegant aluminum shield. CHASSIS: ALS steel tubing and aluminum alloy plates combine to provide a perfect frame, another fundamental feature of the three-cylinder project.More specifically, the frontal tubular steel section ensures good design flexibility that has resulted in a structure perfectly suited to the ride dynamics of the Rivale. 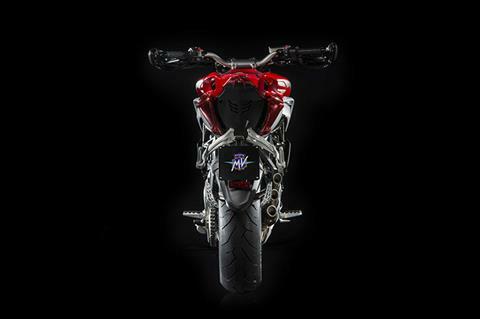 Aluminum alloy plates complete the frame's rear structure, subject to heavy torsional loads due to the long swingarm. 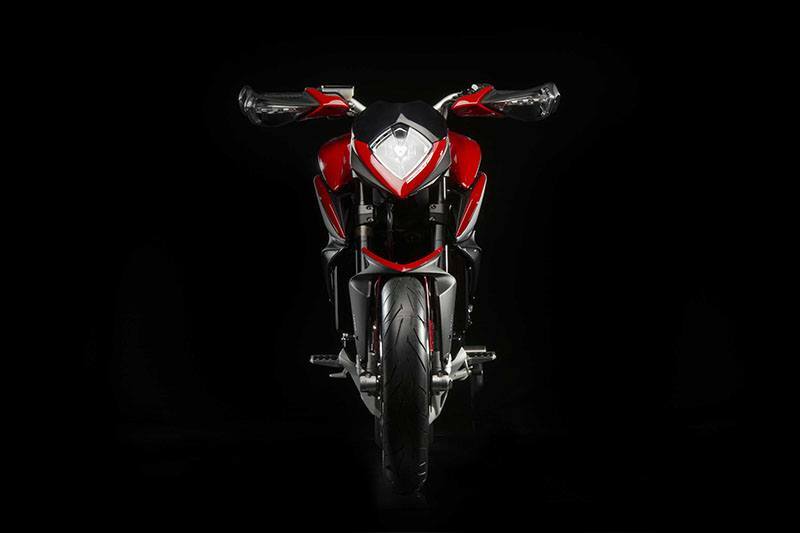 The latter, in fact, plays a strategic role in the project: extremely long in proportion to the bike's tightly compact wheelbase (just 1410 mm), it copes with a full range of ride conditions to give performance-maximizing traction at all times. 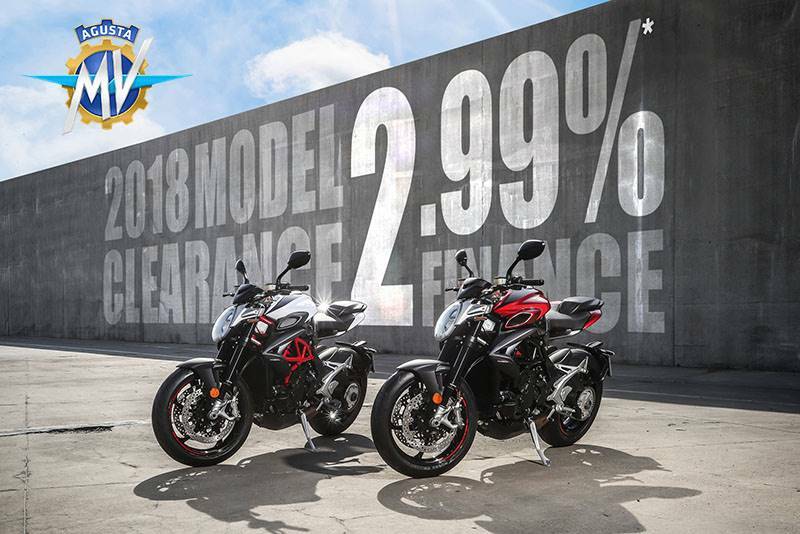 The unique characteristics of the Rivale, an uncompromising ‘fun’ bike, have led to the development of a tailor-made chassis: compared to the F3 675/800 and the Brutale 675/800 models, rake has been increased by 0.5°. Another key feature on this model is the increased suspension travel: the upside-down forks give 150 mm of wheel travel, helping redefine front-rear weight distribution. To boost dynamic performance further, rear suspension kinematics have been adjusted so the wheel now travels 130 mm.A great riding position heightens dynamic efficiency but without compromising comfort: the handlebars, up close to the rider, are perfect for maximised bike control and putting more weight over the front end, making for more precise, smoother cornering.The braking system consists of twin 320 mm Brembo floating discs with four 32 mm piston calipers at the front and, at the rear, a 220 mm steel disc and a double 34 mm piston caliper. Rear - Aluminum alloy, 5.5 x 17 in.